The holiday season is upon us. For many hockey fans that now includes the highlight of the regular season in the annual Winter Classic outdoor game. This year Detroit hosts Toronto at The Big House at the University of Michigan. With an expected 106,000-plus fans in attendance, this game will dwarf all other Winter Classics of the past. Speaking of Winter Classics of the past - that is the focus of Russ Cohen and Michael del Tufo's new book The Winter Classic . The NHL debuted the Winter Classic in 2008 in at Ralph Wilson Stadium in Buffalo to a crowd of 71,217, which still stands as the biggest crowd in NHL history. Subsequent Winter Classics were played at Chicago’s Wrigley Field (40,818), Boston’s Fenway Park (38,112), Pittsburgh’s Heinz Field (68,111) and Citizen’s Bank Park in Philadelphia (46,967). The Winter Classic has been the one event that has transcended the American sports scene as a true hockey event. In many ways it is the most important game on the calendar. Back in 2008 they probably never dreamed it would grow to be such a spectacle. “We weren’t sure if we could sell 73,000 tickets at a football stadium,” said NHL Chief Operating Officer John Collins. “Then we sold out in 20 minutes.” And despite wet and snowy weather, no one left. And it was television hit. Six years later, the Winter Classic continues to thrive, with festivals and sold-out alumni games now part of the experience. HBO's "24/7" documentary specials are fan favorites and the souvenir sales are through the roof. Cohen and del Tufo look to recount all the great moments in their book, The Winter Classic . They also offer a behind the scenes look at each game. The authors offer a look at each venue and discuss why they were chosen. Player interviews about the venues and the games are plentiful. And of course the actual game is covered nicely. 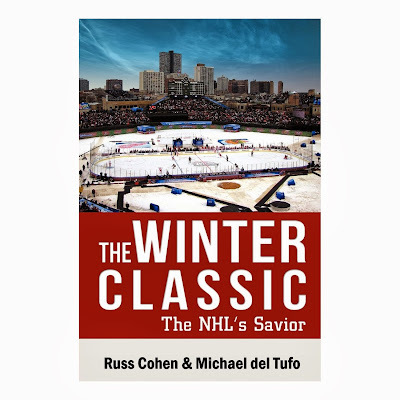 If you are a fan of the Winter Classic, or if you are new to the hockey spectacle, you will want to check out The Winter Classic by Russ Cohen and Michael del Tufo.